Venture out for early cherry blossom sway in spring breeze! 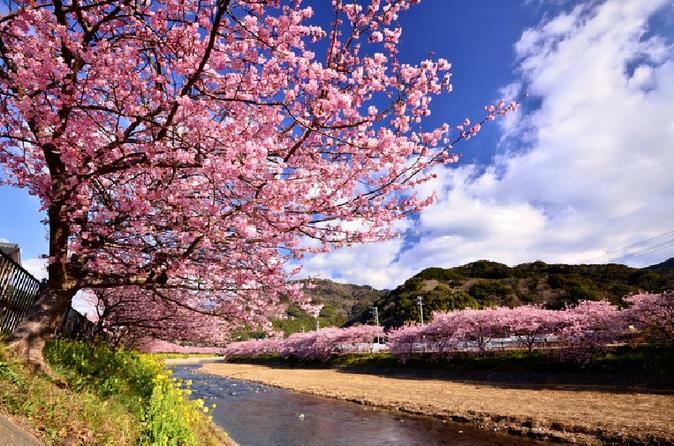 This tour brings you to Izu Peninsula to see the lovely Kawazu- zakura, which is a deep pink cherry species blooming at an earlier period than other cherries. Initially founded in Kawazu Town, now 800 Kawazu- zakura trees are ling up for 4 km along Kawazu River. During the cherry festival, there will be quite a few stalls for local food or souvenirs- please enjoy the bustling scene! Another highlight is Izu’s most famous waterfall Joren Falls located in the center of Izu Peninsula. Lunch is served with tempura udon noodle set meal; there is a chance to experience strawberry picking and for all-you-can-eat tasting. Guests will be gathering at either Kabukicho Police Station or at Shinjuku Station West Exit. We will then depart and take expressway towards Izu Peninsula. First we will stop by local farm for strawberry picking, also tasting for as many as you can within 30 minutes. Here at the farm the spectacular Mt. Fuji can be viewed on a clear day! Then we will head towards the Izu’s iconic Joren Falls which cascade among the greenery. Joren Falls have a height of 25m and width of 7m, and is ranked among Japan’s top 10 waterfalls. Lunch follows next and tempura udon is served to reenergize for second-half excursion. Then let’s head to Kawazu to view staggering cherry blossom. From Kawazu Station, about 800 Kawazu-zakura trees are planted along riverbank for 4km towards upstream. The riverbank appears very stunning with cherries weaved “pink belt”, and the overwhelming view cannot be missed! Also during Feb. 10th to Mar. 10th, Kawazu-zakura Festival is held here. After enjoying the cherry blossom, we will return to Shinjuku and our tour is finished up there.